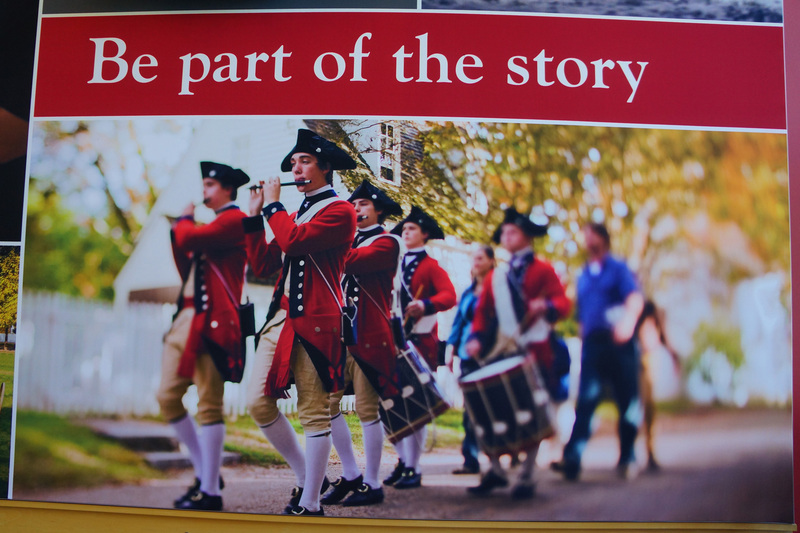 The above is a photograph of part of the wall graphics that greet people entering the Colonial Williamsburg* Visitor Center, very near the admissions ticket counter. I especially love this part of the image because of the “be a part of the story” quote. Quite honestly, it is easy to be a part of the story when you visit Colonial Williamsburg. The entire colonial section is like a bubble out of time (with a lot of modern visitors wandering through). When you go, you have the opportunity to see much of life as it was lived through the artisans and craftspeople there. You get to interact with historical figures: on our last visit, my family and I had the opportunity to discuss issues of the day with George Washington in the Governor’s Palace gardens, have tea with Richard Carlton, the merchant-owner of the coffeehouse just across the way from the House of Burgesses, and chat with Lady Susannah Beverly Randolph, mother** of John “The Tory” Randolph, loyalist to the British Crown. But while my family and I are able to visit Williamsburg fairly regularly, there are many who would but cannot, and many more who are not even aware that such a slice of American history exists. The Historical Williamsburg Living Narrative is an Interactive Fiction project intended for anyone, anywhere in the world to learn about this core piece of the story of the 13 American colonies. Interactive Fiction is a type of computer game that has all the depth and subtleties that only thorough books might offer, but at the same time, it engages the reader in ways that allows them to use the full range of their imaginations and truly be a part of the story. I invite you to be a part of the story of Williamsburg’s history. Please be sure to spread the word to everyone you know that feels excitement at history and at the thought of using their imaginations playing computer games! *Colonial Williamsburg is a registered trademark of the Colonial Williamsburg Foundation. There is no affiliation between the Colonial Williamsburg Foundation and the Historical Williamsburg Living Narrative project. ** An earlier version of this post incorrectly identified Susannah Randolph as the wife of John “the Tory” Randolph rather than his mother and wife of Sir John Randolph. Susannah Randolph was not the wife of John “the Tory” Randolph but was his mother, wife of Sir John Randolph. Thanks for pointing out the inaccuracy! I will make the correction.